Um that headline is seriously misleading. "Thirty percent of those polled think that most illegal immigrants, with some exceptions, should be deported, while 23 percent believe all illegal immigrants should be deported." 30% is not a majority. Anyway their view point is meaningless. It's just a lot of stupid talk. We are not going to be rounding up 10s of millions of people and deporting them. It's just not going to happen. Not only would it be virtually impossible, but the repercussions on the economy would be disastrous, and it would just turn into one big mess. Why do we need to round them up? Can't they simply be deported once they are caught, mandate e-verify and see how many go back. Repercussions to the economy would be limited, and wages would increase, increasing tax dollars at both the federal level and state level. Isn't 30 + 23 = 53? Isn't that a majority? But again, it really goes back to the same way I explained your polls numbers. So, is there really a majority wanting citizenship? How about deportation? At best I would describe it pretty much split. Ignorant? Your talking to the wrong person. So please explain your claim of ignorance. It´s ignorant to believe that Dole Produce Company or any manufacturing company is just going to hire Full Wage Americans when they can just outsource their operations moreso. It´s already been done many time over. 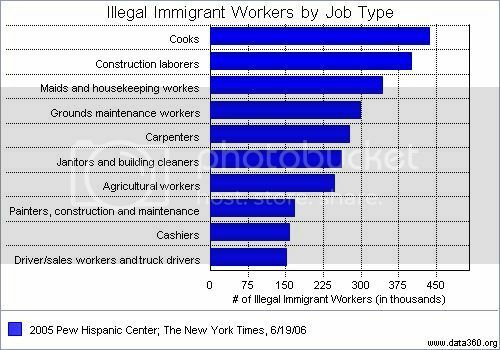 It's ignorant to believe that Dole hires only illegals. Dole would have a hard time outsourcing their operations, since their fields are here in US, HI isn't under any threat of take over. You would do better with some other type of manufacturing. What is a full wage American? All employees who work for a company already receive a full wage. Those employees are also on an I-9 form and reported to the IRS, where if they are illegals using forged or fake documents the company will receive back a letter asking for a SS verification. If to many are at one employer then the IRS will audit that employer along with DHS. Many large corporations under Bush were raided, I wonder why under Obama he has quit doing such? There is a reason the H1-B visa exists and a reason why it´s underutilized. So you´re saying in an industry like produce, where this country has relied on Slave labor, overthrown governments, killed hundreds of thousands just to get a bargain on produce and agriculture products is going to all of a sudden straighten up? As I said, you don't know what you are talking about. The H1B is utilized fully every year, it reaches its total cap every 6 months. It is the H2A that is underutilized and has no cap on it to boot, so the Ag industry can bring in the entirety of the worlds poor provided they could use them. You do know Guatemalans get special privileges right, due to civil war and earthquakes, making them here legally. Really you have to go back to the UFC when you first said Dole. Then you have nothing newer than 1954? your other claims go back to 1917? Really? I would say that if the first group would only make "some" excpection and the second thinks they should all be deported that is a majority pretty much that wants most of them deported. OK, I may have read the article wrong. I'd like to see the actual poll details, but I can't even seem to find the poll on the Ipsos web site. Which seems kind of strange to me. We don't have to round them all up (although rounding up many of them up is feasible) All we have to do is remove the incentives for them to remain here. How would our ecomony suffer a setback with 23 million Americans waiting to fill their jobs? Well it wouldn't help much. How many of those 23 million Americans do you really think would accept jobs as fry cooks, janitors, maids, gardeners, crop pickers, etc.? I can tell, not many. Or they would already be employed there, instead of the illegal workers. The ones that would accept those jobs, would expect much higher wages, and they would get what ever they asked for. Since there would be no one else still here to do the work. Which means that if we got rid of all the illegal workers today. We would see only a very moderate decrease in the unemployment rate. At the same time there would be massive vacancy rates in low minimum wage jobs. We would have hyperinflation like this country has never seen before. Especially grocery prices as crops rot in the fields for lack of qualified people to pick them. Businesses owned by American citizens would be closing left and right, for lack of employees to keep them running. Massive amounts of foreclosures of homes left vacant by the mass exodus of workers from the country. Real estate prices would plummet, and that would just be the start. Pure speculation. Wages in AG have very little effect on end cost of produce. Fuel cost increases have a much greater effect on end cost to consumer. some ag workers already make as much as $25 per hour based on their production rates. Crops wouldn't rot as farmers would change crop to less labor intensive and mechanize. This has already been shown and proven by farmers doing just that in Georgia as recent as the past couple years. You have read into the hyperbole and drank the cool-aid. Everything you have claimed has been debunked by top economists already.